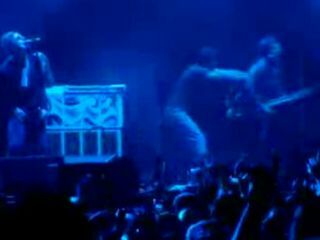 Oasis' Noel Gallagher was assaulted on stage by a man at the V Festival at Toronto Island Part last night (September 7). As the band played Morning Glory, midway through its headline set at the festival, a man rushed the stage from the side viewing area and pushed the guitarist to the floor. It isn't clear if the attacker had more violence in mind as he was immediately apprehended by security guards and later charged with assault. After a short break, Oasis returned to the stage to complete the concert, performing the appropriately titled Don't Look Back In Anger, along with Wonderwall and three other songs.They finished with their traditional show-closer, The Beatles' I Am The Walrus. MusicRadar is happy to report that Noel is OK after the assault (although he was taken to a hospital after the show and examined for a possible fractured rib). As for the attacker, he must be a Bloc Party fan (listen to our interview with Noel and you'll see what we mean), or an old-school Blur lover from back in the day. Here is a YouTube clip of the event - the incident occurs at approx. 1:30 minutes in.